Guardian Letter This letter was sent to the Squid by a local from the midwest and is a great summary of the BIF mining situation from a locals perspective. BHP Announces $2.2b expansion: Do we need to mine the BIF? Today BHP announced a further 2.2 billion expansion of their iron ore operations in the pilbara. The expansion in their operations will dwarf the small scale banded ironstone mines in the midwest and goldfields that threaten rare plants and animals, and WA’s outback landscapes. BHP is increasing production to 240mtpa. The total production of ore from the proposed A-Class reserve at Mungada Ridge where mining has recently been approved against the advice of the EPA, will be less than 2mtpa. The expansion of BHP’s operations in the Pilbara already has plenty of environmental and cultural problems, such as a current court case from Traditional Owners, but the point is that there is no need to expand the damaging impacts of iron ore mining into new high conservation areas in other parts of the state. 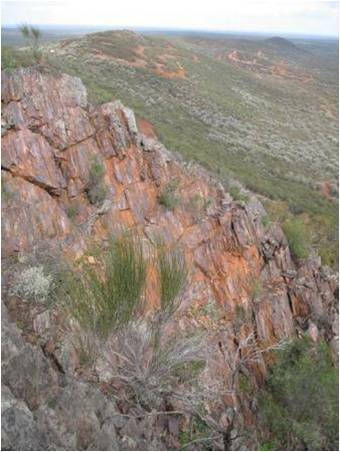 There is a case for some iron ore mining in the midwest, but not in high conservation value ranges that have been identified by environmental authorities as worthy of protection in A-Class nature reserves. There are many BIF ranges in the region from which these small quantities of ore could be mined without destroying WA’s unique biodiversity. Mining Article from 2006 – Has anything changed? 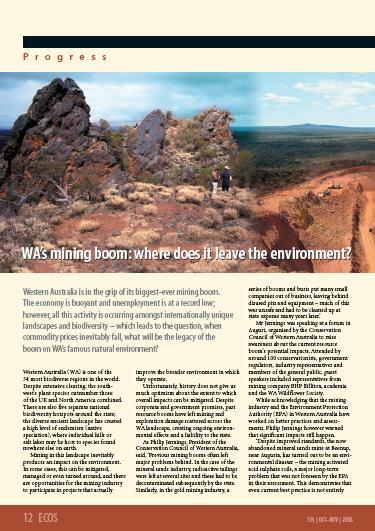 Found a link to this article published in ECOS magazine in 2006 about the mining boom that was just getting into full swing. With a new mining boom just starting up, I read it again. Sadly, it could be published again now in 2010 and it would still be relevant – nothing has changed. So with that in mind, I thought it timely to share this again. A mating ritual of hammerhead sharks off Perth beaches was captured by Nine news in Perth. Check out the video. In a summer season with many shark sitings fear can blind us to the beauty and mystery of sharks, so was great to see this piece on the news. Our ancestors often gave sharks a mythical status, and whilst we may never fully understand the spiritual connections they may have had to sharks, modern ecology certainly tells us that the role of sharks as apex predators is something of great importance to the health of our oceans. At a time when sharks, creatures that have inhabited the seas without significant change since before the time of the dinosaurs, are at an unprecidented level of threat due to chronic overfishing around the planet, more care and awareness is critically important. Many sharks do not breed until they are many years old, and then have as few as one pup per year. They are designed to rule at the top of the ecosystem, not to recover from heavy fishing, bycatch and shark fining. As this video shows, whilst some sharks can be dangerous, they are also beautiful creatures worthy of our awe, respect and care. 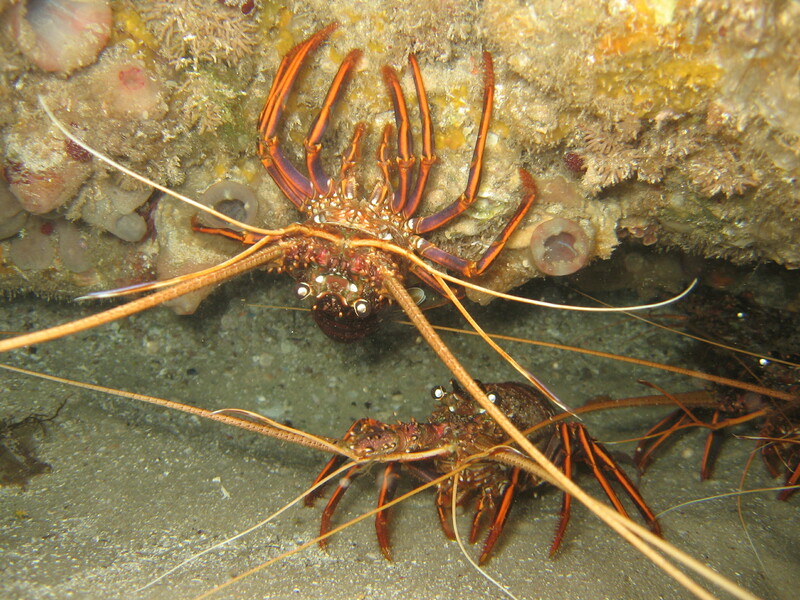 The results of a special review of WA’s western rock lobster fishery by the Marine Stewardship Council (MSC) released today have recertified the fishery despite concerns about overfishing and declining stock levels. The detail of the report shows that whilst recertification was confirmed, the MSC is concerned about the methodology used to predict stock levels, the stock levels themselves and the lack of research into the ecological effects of the fishery that operates along most of the southern part of WA’s west coast where less than 1% of the marine environment is protected. The fishery is Australia’s most lucrative and the rock lobsters themselves are a keystone species in WA’s marine environment. A collapse in rock lobster stocks would be an economic and environmental disaster. The health of the fishery is measured by counting the number of larval lobsters (puerelus). These numbers have reached historical lows, prompting the review. Whilst some scientists consider that the fishery should be closed altogether, the industry has taken voluntary cuts to try and rebuild stock levels. The Squid doesn’t know who is right, but reckons if what is considered one of the world’s best managed and most sustainable fisheries has got to this point, it is another solid argument that we need a network of large marine sanctuaries to insure against the effect of mistakes like this and protect our marine life for the future. 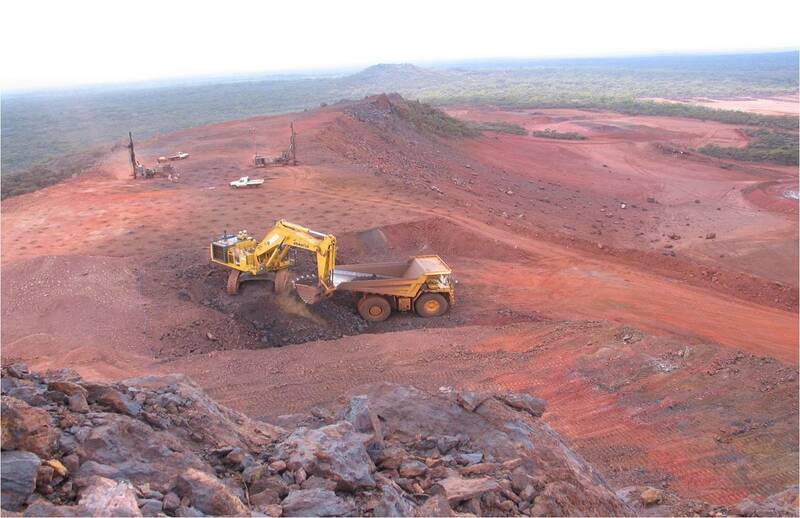 Midwest mining company Sinosteel Midwest Corporation will be allowed to go ahead with mining at Mungada Ridge after today receiving environmental approval from the federal government. The approval comes three months after state Environment Minister Donna Faragher upheld the company’s appeal to overturn the advice of the state’s independent environmental watchdog, the EPA, who had recommended against the project. WA Business News reported that “There had been issues with the classification of some areas of the project as a category A reserve.” Meaning that this area is within the areas proposed by the EPA and previous State Government as an A-Class Nature Reserve, the highest level of conservation protection available in WA. It seems that this small mine is merely a cashcow for larger developments. The Squid would prefer that they used the stockmarket to raise cash, rather than digging up WA’s precious environmental assets.